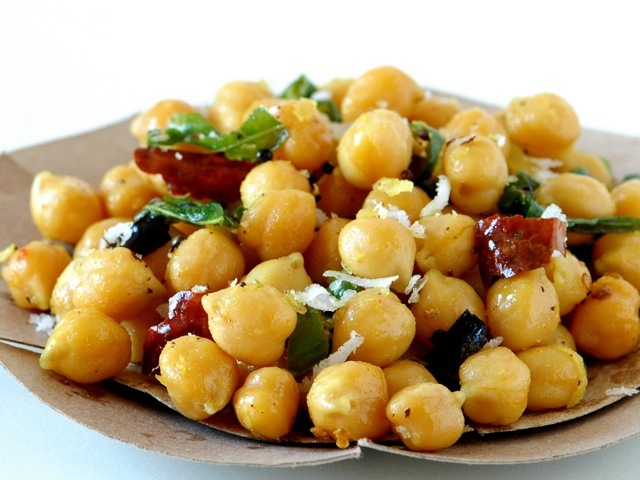 Sundal is a traditional South Indian chickpea dish and beach snack. If you can't find fresh curry leaves (available at any Indian grocery store), sprinkle some fresh chopped cilantro over the finished dish instead. Put two teaspoons of the oil in a medium sauté pan and turn the heat to medium. As the oil becomes hot, add the chile, asafetida, and curry leaves; don’t let the oil smoke. Add the chickpeas and sauté for a few minutes. Stir in the coconut and tomatoes and add salt to taste. Serve hot.